At the end of a long weekend in September, two-dozen people shelled beans, shucked corn, squeezed the seeds out of tomato fruits and blew dusty chaff off of piles of amaranth and mustard seeds. Seed Savers Exchange hosts many workshops on saving seeds throughout the year at Heritage Farm. 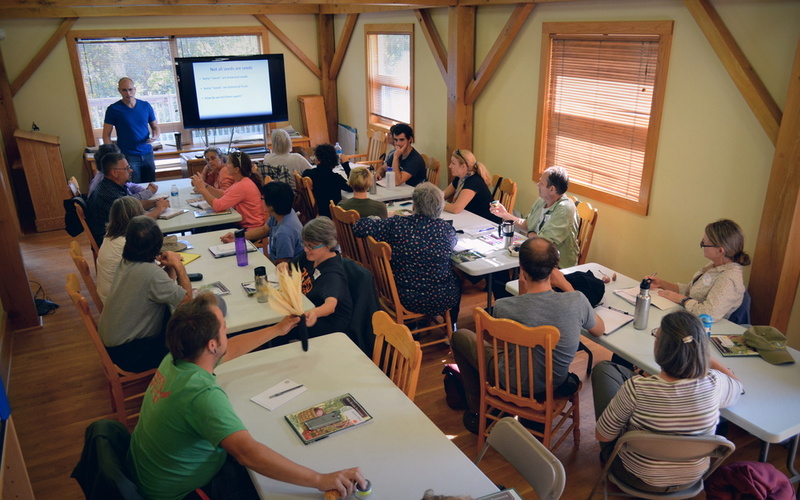 Those twenty-four seed savers came to Heritage Farm from all over the country to attend our 2nd annual Seed Saving School. After three days of workshops, tours, classes and meals, they floated away, one by one, as we harvested seeds in the afternoon. Like individual seeds, those students possess the resources they need to grow and multiply. They can return to their communities and spread their knowledge to create more and more seed savers. Although it was a great weekend, you don’t need to travel to Heritage Farm to gather the tools for seed saving. You probably have many of the supplies floating around your house or your garage. 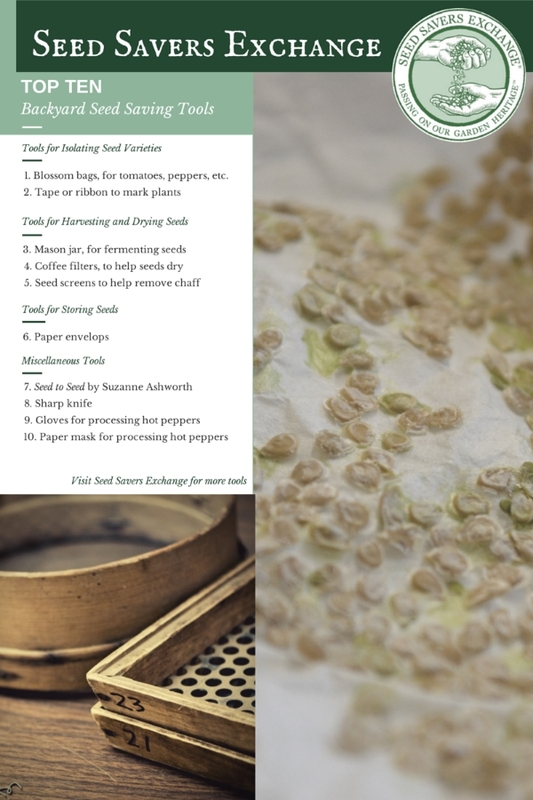 Throughout this post, we will walk through a few of the classes that were taught during the Seed Saving School and highlight the tools we used in those classes. We spent a portion of the weekend talking about how to process seeds from wet-seeded crops like tomatoes, cucumbers, squash, melons, eggplants and peppers. A mason jar comes in handy when you’re processing seeds from two fruits, tomatoes and cucumbers, whose seeds need to be fermented for several days before they can be cleaned and stored. 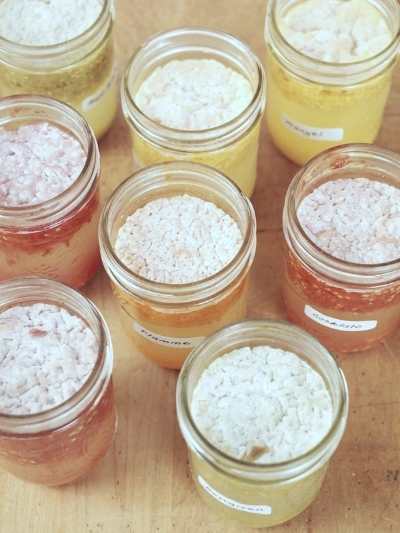 Fermenting tomato seeds build a layer of mold. Harvest tomatoes for seed when they are ready to eat. You can squeeze the seeds and pulp of one variety of tomato into a mason jar. Place the jar of seeds and pulp in a well-ventilated space for a few days until the good seeds float to the bottom of the jar and the pulp and debris rises to the top. This fermentation eats away at the gel-like sack that encloses the tomato seeds and it will help your seeds germinate well next year. You can save seeds from cucumbers when the cucumbers are past maturity, when they have enlarged and changed colors. Save cucumber seed in the same way that you would for tomatoes. It might surprise you to learn that coffee filters are another great tool for processing wet-seeded crops. After you’ve harvested your seeds and washed away any pulp and debris, you can set the seeds out to dry on a coffee filter before storing them. We walked around the gardens on the last day of the seed saving school, looking at different plants whose seeds were already dry and ready for harvesting. Plants like beans, peas, lettuce, mustard, radishes, amaranth, dill and flowers are all dry-seeded crops. It is useful to have a seed screen when harvesting dry-seeded crops. These screens help gardeners separate the seeds from the chaff, the debris that is leftover when harvesting seeds. You can create a sturdy seed screen by using metal mesh and a few pieces of wood. Grant Olson, our Public Programs Manager, created this handy instructional for making your own seed screen at home. Seed Savers Exchange teaches courses on basic seed saving throughout the year at workshops and through webinars. We spent a bit of time talking with our students about the ideal conditions for seed storage. Seeds like to be kept in a cool, dry and dark environment. Once seeds have dried completely, you should put the seeds into a container that will allow air to circulate, that will not trap in moisture and that will not be easy for critters to get into. We often use small paper envelopes for storing seed for our personal collections at home. You can create envelopes out of recycled paper or even old magazines. Be sure to label your envelopes with the plant type, species name, variety name, and when you harvested the seeds. To further protect these seeds, you can put the paper envelope into a jar and put a screen over the top to prevent critters from getting into your collection. Here at Heritage Farm we maintain varietal purity in a number of ways. We separate plants by distance, we build isolation cages for certain plant types, and we hand-pollinate other crops. All of these techniques help us ensure that the Chapalote corn that we plant remains Chapalote corn and that the Sibley squash is still a Sibley squash when we plant its seeds next spring. Seed Savers Exchange board member David Cavagnaro teaches students about saving seeds from biennials. You can isolate plants by distance in your home garden and you can also hand-pollinate crops such as corn and squash with just a little bit of practice. It is also possible to build isolation cages for your plants, but an even easier way to isolate varieties is to use blossom bags for individual flowers on plants like tomatoes and peppers. Blossom bags, which are made with a very fine fabric, can be made with tulle fabric and string or they can be improvised using party favor bags. Put one of these bags over the flower of a tomato plant before the flower has opened in the spring. After that flower has opened and you see that it is setting fruit, you can remove the bag, confident that no pollinators have compromised the seeds of those fruits. Mark these fruits with tape or a ribbon so that you know to save seeds from them later in the year. Our Events and Outreach Coordinator, Renata Christen, led a class on sharing seeds. She talked with students about the importance of regional seed groups and the different steps you can take to create a seed library or seed swap in your community. There are many of resources available through the Seed Exchange where you can learn more about the Community Seed Resource Program and other programs such as Herman’s Garden. The Exchange hosts many online tools that give you instructions about how to start a seed library, how to host a seed swap and basic tips for saving and sharing seeds. Since the tools you need for seed saving are probably already at your fingertips, we encourage you to get out into your garden and save some seeds! If you are interested in diving deeper into the world of seed saving, consider attending our Seed Saving School next fall. It was a remarkable weekend filled with interesting folks from all over the country. Who knows?! Maybe some of them live in your hometowns and you’ll have a chance to meet them at a seed swap or in a garden near you.